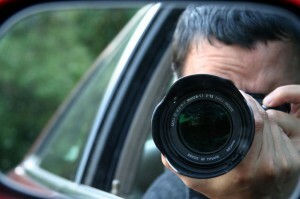 One of the greatest weapons which an insurer has in their arsenal of defence strategies is surveillance. For those of you who don’t know, surveillance is when an investigator follows an accident victim and films, records them, or takes photos of them when they’re out and about in public. For this Toronto Injury Lawyer Blog Post we will NOT be examining the growing field of cyber/on line surveillance. Rather, we will dig deep in to the field of “old school” sleuthing surveillance where the Plaintiff gets followed or tracked by an investigator or team of investigators. For most accident victims and disability claimants, they don’t know they’re being followed until it’s too late. Others recognize they’re being followed immediately, but still go on with their normal routine. A picture says a thousand words. Pictures and film recordings in the context of a Judge along or Jury Trial in Ontario are very persuasive. Hearing a medical expert drone on and on about pain complaints can get very boring. BUT A MOVIE: now that’s exciting. Think back to the days when you were in grade school. A teacher would lecture and the students would fall asleep. No matter how engaging the teacher, there were always a few kids in the classroom who never paid attention. BUT, when the teacher brought in the television to play a movie, or to show some slides, even the kids with the shortest attention spans perked up. This is exactly what happens in the Courtroom when the lawyer for the insurance company plays their surveillance video. All of the jurors immediately perk up to see what the investigators caught on camera. Those video and still images leave a lasting impression on the jury. It shows the Plaintiff in a light they don’t want to be seen in. It shows the Plaintiff engaging in normal every day life when they think there’s nobody watching. For those reasons, surveillance is a very powerful tool which should not be underestimated. Our lawyers would like to share with you some of the top places which investigators catch accident victims and disability claimants doing things which they said at discovery they could NOT do; or which their doctors told them that they ought NOT do. Beginning surveillance is rather easy for the defence. They will have your address and contact information once the litigation process begins. If they don’t have it, they have many ways of getting such information. That’s their starting point. 1. GROCERY SHOPPING Everyone’s gotta eat. The grocery store is a fantastic place for an investigator to get an accident victim or disability claimant in a compromising position. People often say at discovery that they can’t bend. The surveillance might catch them bending to get an item on the bottom shelf. Same thing applies for reaching high and grabbing food on the top shelves. Other instances they catch disability claimants are when it comes to lifting. A person might state at their examination for discovery that they can’t lift items more than 1 pound. Then there are images of them lifting a bag of rice (which weighs more than 1 pound), or lifting a case of pop or water. Both instances call in to question the Plaintiff’s credibility. The same lifting example applies for carrying bags of groceries from the store and placing them in to the car. A busy grocery store also gives the investigator great cover to blend in with his mini camera amongst other shoppers. 2. DRIVING At discovery, a plaintiff might say that they cannot sit for more than 20 minutes without needing a stretch of changing positions. Then the investigator gets video of the person driving in their car for more than 40 minutes from one end of the City of Toronto to another. Or, they catch the accident victim going on a long road trip to see a family member for a holiday. Driving is an easy one for the investigators. Other driving examples are when an accident victim says that they cannot twist or turn their neck properly on account of a collision. Then, the investigator has tape of them swinging their neck around to back up their car, and swinging their neck to check their blind spot on a lane change. Another example is when a person says that they have difficulty bending down, or getting up from a seated position such as in a car. The investigator might have video or photos of the Plaintiff getting in and out of their car freely without the need for any assistance. All of these examples don’t fare well for a Plaintiff’s credibility in a personal injury action. 3. TRAVELLING TO/FROM APPOINTMENTS If you’re really hurt, you’re likely attending a LOT of appointments with various doctors, physiotherapists, lawyers, or other health care professionals. I’m always amazed by the volume of surveillance taken of people going to the hospital or to visit their family doctor. On one hand, it shows that the Plaintiff is going in for treatment. After treatment, the accident victim might feel much better. I know clients who feel GREAT after going to get a massage, or physio, or after a nerve block injection. On the other hand, the video might show the Plaintiff doing something or moving in a way that they said they could not move. It really depends on the nature of the injury, along with the treatment, and what the medical and discovery evidence is. 4. TAKING THE KIDS TO, AND PICKING THEM UP FROM SCHOOL If you say that you can’t lift greater than 15 pounds, but then there’s tape of you lifting your 6 year old daughter in to the car, and out of the car, and lifting her to the entrance of her day care/school, you’re going to have a lot of explaining to do. This is so hard for accident victims to understand. It’s their own kid. How can you resist lifting them? But if you SWORE UNDER OATH to tell the truth, and now there’s evidence of you doing some lifting of much greater than 15 pounds, you will have a lot of explaining to do. 5. ATTENDING AT AND LEAVING THE BEER OR LIQUOR STORE Tell the lawyer for the insurer that you don’t drink any more since your car accident? Tell the lawyer that you can’t lift large or heavy objects greater than 3 pounds. Chances are that the lawyer for the Defendant will catch you attending at the Beer Store or Liquor Store and leaving carrying a box of bottles or a TWO-FOUR of Beer. Nothing looks worse for a Plaintiff. This one hurts on so many levels and it seems to happen quite frequently. 6. ATTENDING AT A LARGE/SMALL EVENT, GATHERING OR PARTY People with psychological injuries may swear under oath that they no longer go out socially, or hate large crowds, or have too much anxiety to see others so they stay at home all day long. Then, the investigator gets tape of that very same person attending at a rock concert, attending at a party, or attending at a community festival of some sort. There are ALWAYS happy and smiling people at concerts, parties and festivals. Chances are you’re having a good time, or pretending to have a good time and it will show on your face in those pictures which the investigator is taking. If you swore under oath that you no longer attend or have NOT attended at one of these gatherings, there’s only so much that your lawyer can do to protect you. You’ve now been caught on tape and there’s no going back on it. A better answer may have been to simply tell the truth. I tried going to the fair, but I had a terrible time and forced my friends to take me home early. I couldn’t handle the crowd. My anxiety was getting to be too much for me to handle. OR, I went to the concert. I thought I would be ok. I wasn’t. I had a leave after the first song and go in to a quiet room or sit in my car and wait for the concert to finish. Lesson: Just tell the truth! The moment you start to lie, make things up, or answer questions with absolute certainty when you’re uncertain about things is the moment the lawyer for the insurance company will attack your credibility. The end result is that they can turn an otherwise STRONG and MERITORIOUS case in to a much weaker one, REGARDLESS of the severity of your injuries. Credibility is as much an important factor in getting compensation as are the nature of your injuries. So, if you’re really injured, you should have NOTHING TO HIDE. Just tell the truth and everything will work out one way or another. Enough Law Talk? Sure. We can’t believe that the release of the movie The Interview is being delayed on account of an information leak linked to cyber terrorism. They should have the courage to release the film. What a sad state of affairs for a comedic film/parody. From our law firm to your family, we wish you a happy, health and safe Holiday Season and a Happy New Year. Don’t drink and drive.